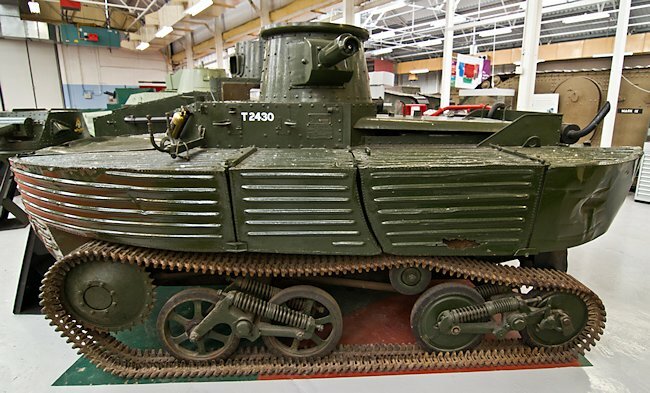 In 1939 Vickers designed an amphibious light tank based in their Mk.IV light tank to help the Army establish a bridgehead on the other side of a river when the normal crossing point had been blown up by the enemy. It would give covering fire for the engineers who were repairing the bridge or building an new pontoon bridge. During World War one large areas of North West Europe had been flooded as a defensive measure especially in Belgium. Vickers also realised that any future war in Europe would have to over come the problem of armies crossing rivers, canals and lakes. Their amphibious light tank was a solution to this problem. 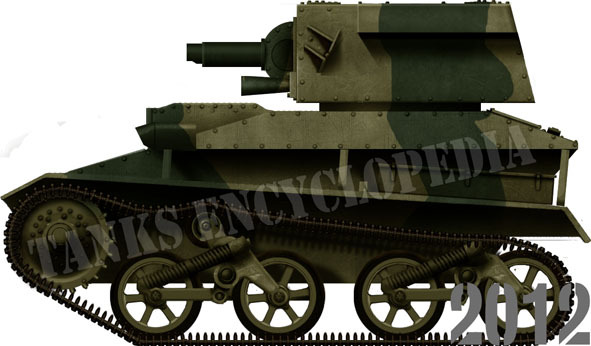 The Vickers Light Tank A4E3 was officially called Tank Light Amphibious No.3 E1951.33. It was the third attempt at building a swimming tank. 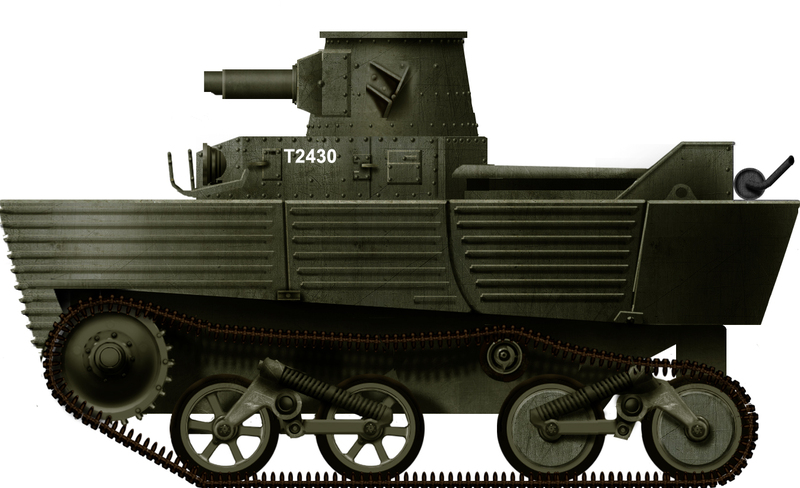 The previous prototype designs were known as the L1E1 and L1E2. 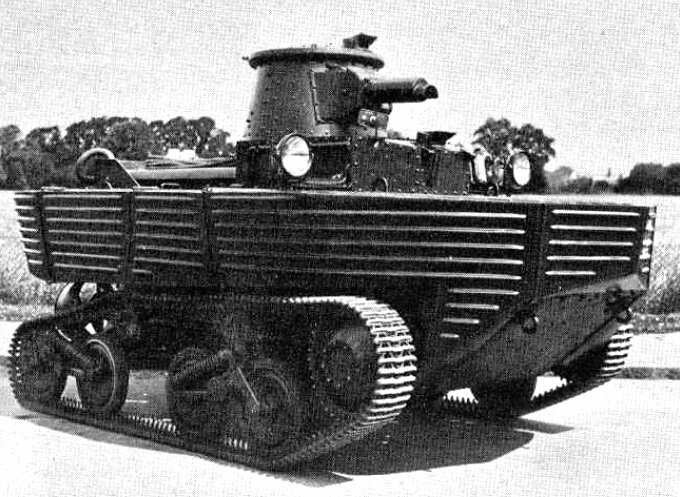 This latest version of Vickers-Armstrongs radical amphibious tank design, the A4E3 L1E3, was armed with a .303 Vickers machinegun fitted to a 360° turret. It was powered by a Meadows 6 cylinder, model EST, water cooled petrol engine that produced 89hp. It had a maximum road speed of 35 mph (56 km/h)and a maximum speed in the water of 5 mph (8 km/h). It had a maximum operational range of 120 miles (193 km). The crew of two were protected by armour that had a maximum thickness of only 11 mm. It weighed 4.3 tons and was 14’9″ (4.5m) long, 7’6″ (2.3m) wide and 6’10” (2.1 m) high. When in the water, the two propellers were driven by two smaller engines mounted in the back, driven by the main engine. 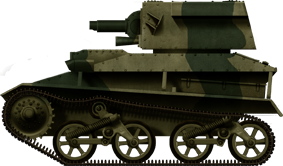 The light tank L1E3, which was built in 1939, was produced specifically to British War Office requirements. 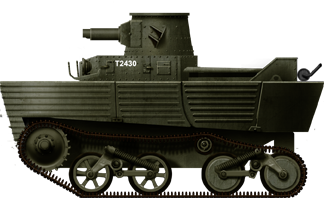 Most of its mechanical features are identical to contemporary Vickers light tanks but the hull is surrounded by aluminium floats, filled with kapok, to provide buoyancy. Two marine propellers, shrouded in steering cowls, are fitted at the back but driven by shafts from the front sprockets. The tank was even equipped with a small boat anchor at one time. When in the water, the two propellers were driven by two smaller engines mounted in the back, driven by the main engine. An amphibious tank’s greatest problem is getting out of the water, especially on muddy river banks. 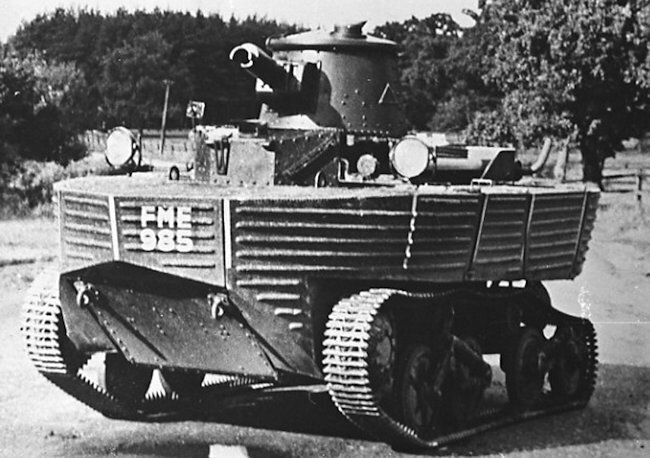 The front of the vehicle’s hull armour was very steely angled to assist in overcoming steep river banks. A modular approach was taken when designing the floats. Each side had four aluminium box like compartments. The thinking was that if one got damaged by enemy fire and started to take in water the other three floats would not be effected and still be able to keep the tank bobbing along in the water if now at a slight angle. The driver sat in the front of the tank in the middle and his head was protected by an armoured box that jutted above the floats. It was fitted with a periscope so he could still see when his hatch was buttoned down in battlefield situations. This Vickers design was never adopted. The tank was tested briefly at the start of the war, spent the next four or five years in reserve and was then subjected to more tests after the war, by which time it was completely out of date. 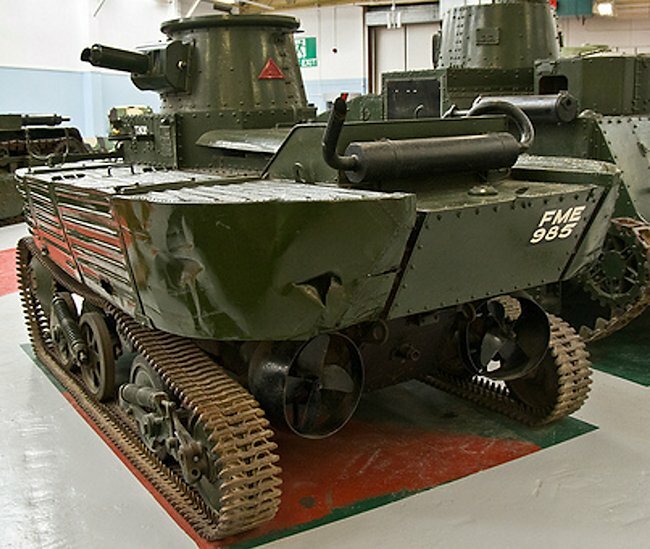 Vickers-Armstrongs built two earlier amphibious light tanks between the wars: the L1E1 and the L1E2. They enjoyed some modest export success, notably in Russia where it was copied. 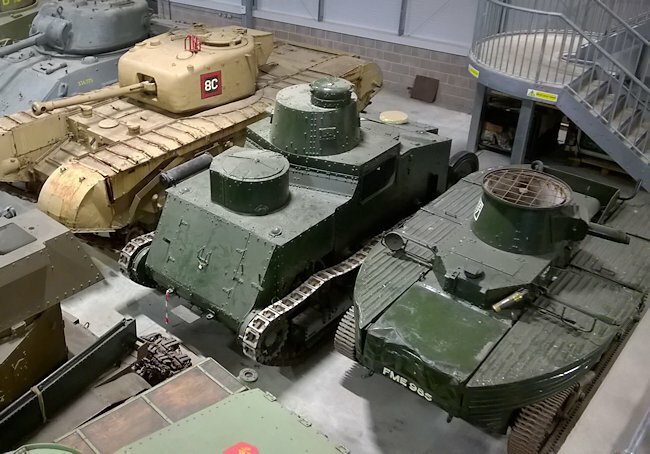 For some time the Vickers Amphibious Light Tank A4E3 (L1E3) at the Tank Museum Bovington had been exhibited in the ‘Inter War Hall’ but recently it has been moved to the large Vehicle Conservation hall where it is awaiting its turn for a make-over tank overhaul. If you look at the wheels on the surviving exhibit and compare it with original photographs of the 1930’s you will notice that the track wheels are different. They were damaged and exact spare parts could not be found. Replacement wheels from a variety of different tanks have been used. The original ones were hollow to assist with buoyancy. 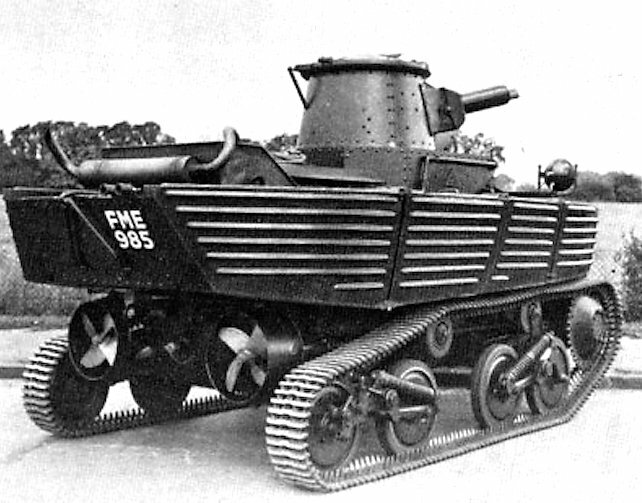 One of the major downsides to this amphibious ‘tank’ is that it was not bullet proof (although the one at the Tank museum has been built using soft steel) and the Kapok used in the flotation devices is highly flammable. That means you have an armored vehicle that was prone to being shot up by machine guns, bursting into flames and then sinking all at the same time. No wonder it did not enter production. Vickers Light Tank Mk.IV, Great Britain, 1939. 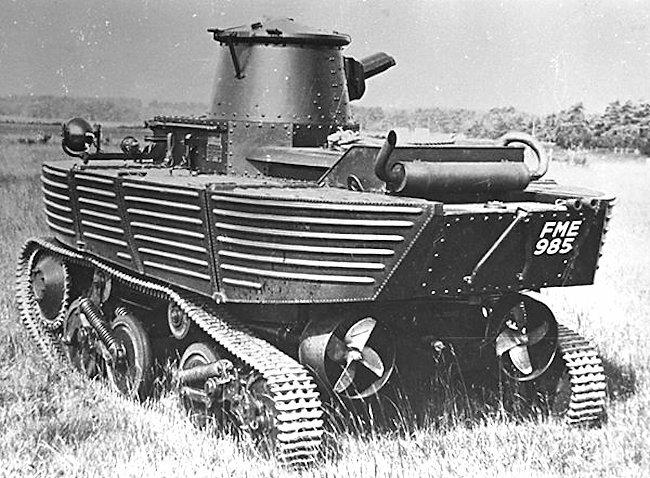 Vickers Amphibious Light Tank A4E3 L1E3 prototype, 1939. The driver sat in the front of the tank in the middle and his head was protected by an armoured box that jutted above the floats. It was fitted with a periscope so he could still see when his hatch was buttoned down in battlefield situations. The tank’s hull shape, with the attached floats, was very boat like. 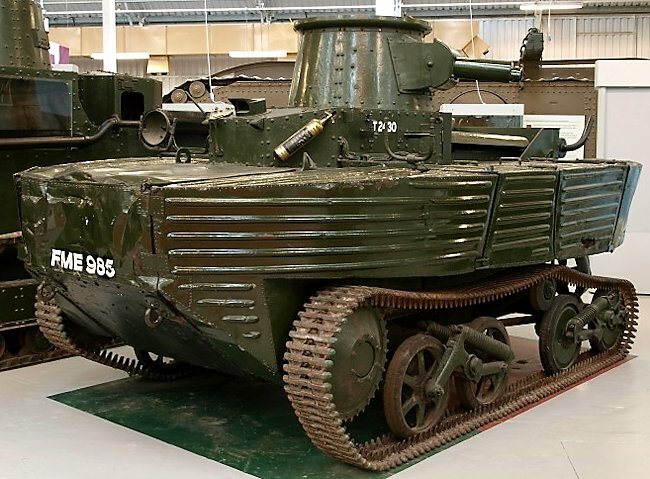 Vickers Amphibious Light Tank A4E3 (L1E3) at The Tank Museum Bovington England. Notice the steep sloping front to help the vehicle climb out of river banks. 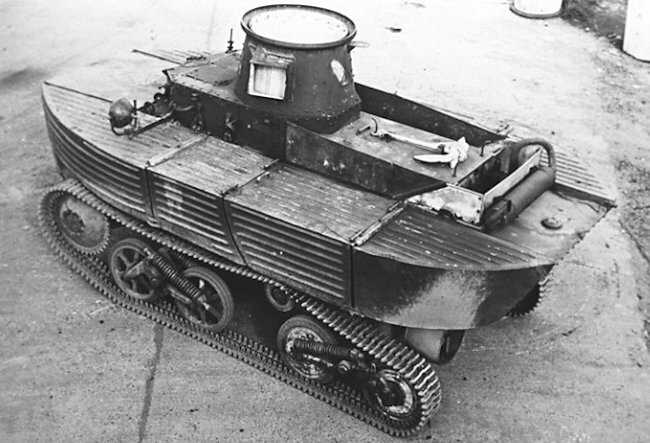 The Vickers Amphibious Light Tank A4E3 was powered by two propellers at the back of the vehicle when in the water. Earlier versions only had one propeller. A modular approach was taken when designing the floats. Each side had four aluminium box like compartments.